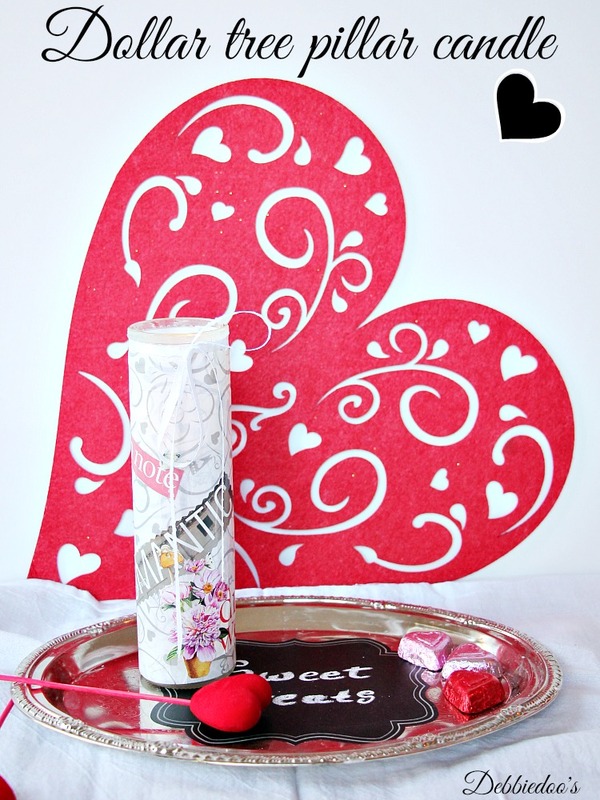 Well, continuing on my dollar tree decor frenzy, I thought I would share a mod podge and dollar tree Valentine candle. Actually, I did this last year, and never had a chance to share it with you. I think I did too many crafts and before we knew it, Spring had Sprung and no one cared. I don’t share too many fancy shmancy things over here in case you have not noticed. I love to craft, and of course the cheaper the better. A few years back I made some vintage pillar candles for our fireplace. 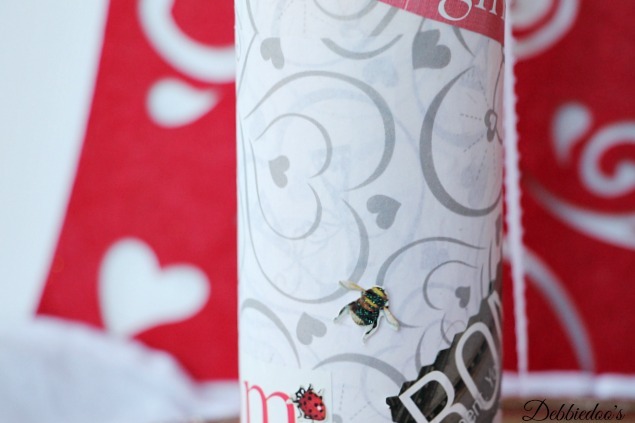 So many cute things you can make per season and you can find them at the Dollar tree. BTW, they do not pay me to say these things. Sometimes, I get paid to share a craft, but I let you know you that upfront. 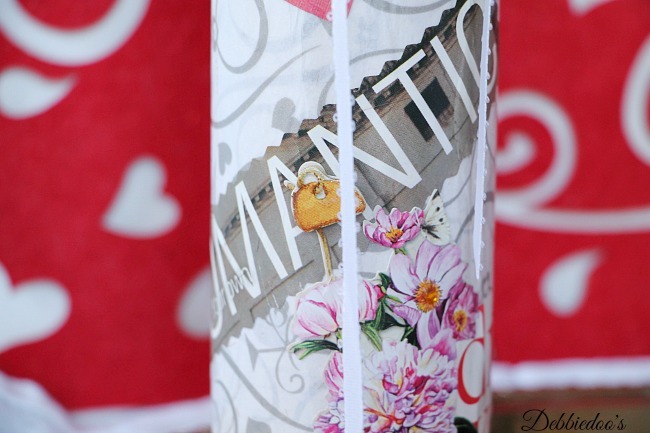 First I mod podged the candle in sections and then cut some tissue paper to adhere to the candle. You can smooth it out with your finger as you go, gently though. I had some of the cute scrap book embellishments also purchased at the dollar tree and they had little sticky markers on them so all I had to do is stick those on accordingly. I found LOVE inspirational words from magazines and cut them out with some rigid scissors and mod podge them on randomly. 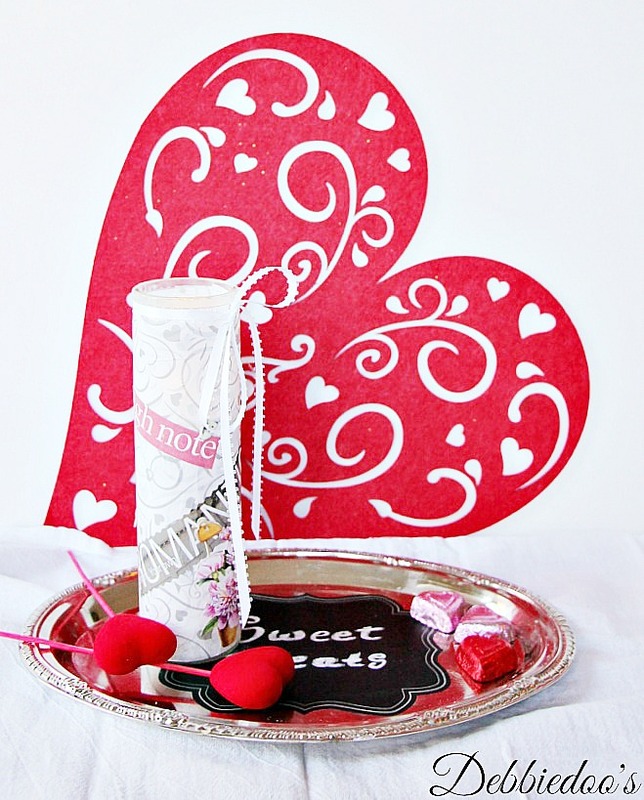 The big red felt heart, tray, heart pics and candy all from the dollar tree. found at Walmart in a multi pack. Follow me around if you like. Valentine gallery of ideas from last year. You are the queen of crafts my friend…soooooo pretty! I need to get out of this house and hit up the Dollar Tree! Walmart is on my list too. We finally have a break in the weather so hopefully today. These are so cute! So cute Debbie!!!! Happy New Year my friend!!! I’ve found 5 of those pillar candles in the storage room and was going to return them. Guess I have a project to do now. 🙂 Thanks for sharing those adorable ideas, Debbie. Those are really cool Debbie! I did not even realize those words were from a magazine. Love the dollar store crafts! Happy New Year! You mentioned you found the chalkboard labels at Walmart, but what other stores do you recommend trying to find them? This is a really cute idea! I’m excited to try it! What a great idea!! I love Modge Podge! I love the Dollar Stores!! 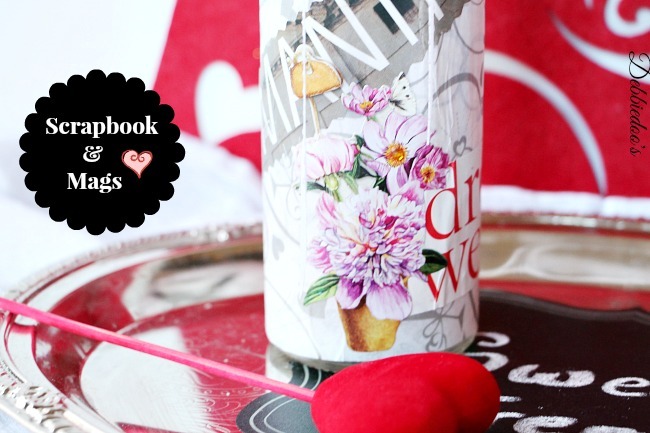 What a great way to bring life to a boring candle, and it’s perfect for Valentine’s Day. Cutting out from the magazines takes me back…way back.